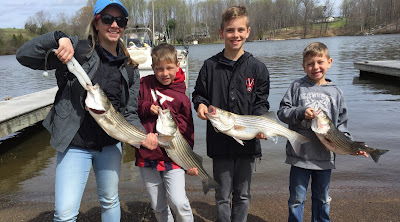 The kids are trying to hold a few of the Stripers they caught this morning up for a picture. Tyler and Nate holding up the 2 best fish of the morning. This morning I got on the water before 4 to catch bait and was ready for the guys when they showed up at the ramp. I hate this East wind and I told the guys we would catch fish but the fish would be lethargic and mess with the baits more than eat them. We set up on a flat and had four or five rises and pullbacks then a couple boats ran over us but we knew it was the weekend and the wind was not in our favor. After awhile we boated a couple fish then a couple more but it was slow. We continued to take hits but the fish did not want to commit to the baits. After fishing a couple different areas of a similar pattern and only catching a couple fish we moved to another spot. We hit this flat twice with only a couple rises then off to the south we saw a fine mist of rain headed our way. The water got a little chop, the went shifted a little and the fish turned on. For about an hour we were in heaven., We caught some really nice Stripers today but we lost some nice ones as well due to their lethargic feeding habits this morning. 'Tiss the season for Big fish. We are booking fast so if you want to be in one of these pictures better hook up with to battle on of these Giants. Remember I am raffling a full day charter for 6 for my grandson's Baseball team, check out March 24th post for details. Tony took Dan out on Saturday and put him on this nice 22+ pound Striper. After reviewing the picture of Dan holding his fish Tony held it up to show its true size. 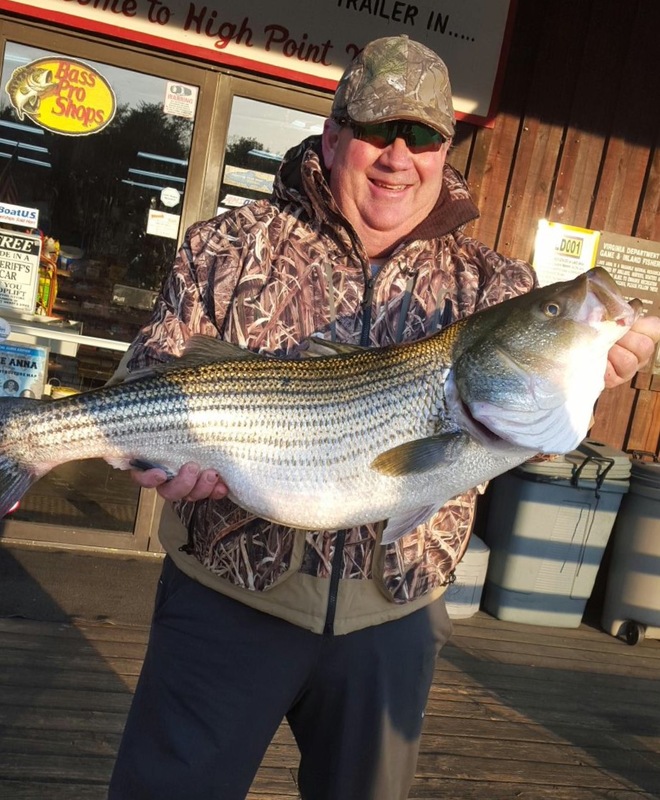 Who wants to win a full day Charter fishing for Stripers on Lake Anna with Jim Hemby? This year I am giving away a charter to raise money for my grandson's baseball travel team, the Fauquier 11U Raiders Travel Baseball team. The team is selling a limited amount of tickets for $20 per ticket or 3 tickets for $50. The drawing will be held on the field by the umpire of their game on May 1st. The money raised will help defer the costs of uniforms, umpire fees, tournament entry fees and equipment. Tickets can be purchased from the parents of the players or Checks, Money Orders or Cash can be mailed to Emily Hemby, PO Box1126 Middleburg, VA 20118. Upon receipt you will be mailed back the ticket stubs to your return address. 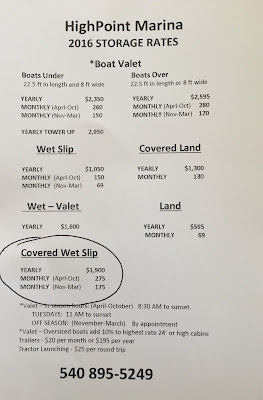 Any of my clients or friends can contact me and I can leave tickets for you to pick up at High Point Marina or you can get them from me on the water. [Jim_Hemby@hotmail.com, 540 967 3313] or message me on facebook. Tickets need to be purchased prior to April 28th. Winner will be notified immediately after drawing. Trip can be used anytime in 2016. This is a great opportunity to help support the young men on the team and help them achieve their goals for the year. Whether you are a friend or relative of one of the teams family or a client of mine who wants to take a chance on winning a full day charter your investment in these young men will go a long way. 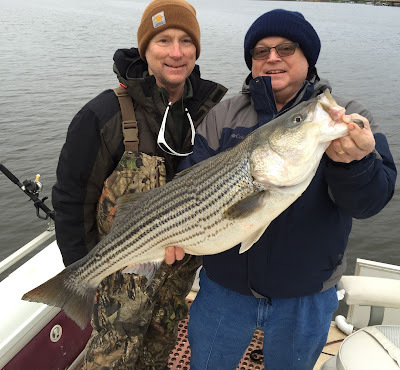 Old friend Howard wanted to take some friends fishing today so he put a trip together and we went out this morning. I got out early and caught a bunch of nice baits then picked up everyone around 7am. We knew the wind was going to howl today but Howard said if we could just catch a couple fish before the wind got up everyone would be happy so we gave it our best shot. This time of year fish are usually in "spots" and unfortunately these spots are not on bluff banks or out of the wind. I fought the wind till my 36 volt trolling motor tapped out and we managed to get 13 keepers to the boat before we had to come in. Fishing in the wind has its challenges but it is all worth it to see the smiles on peoples faces when they reel in a nice fish. Some of the guys came out to catch bait with me this morning then we picked everyone else up and went looking for fish. I started to set up on some deep fish when a friend called and said he just popped two very shallow. I changed plans and put out a spread of boards and pulled the nearest shallow flat. We pulled 500 yards without a strike so I decided to go back out deeper. As soon as we dropped off over 20 feet we started seeing Stripers again. 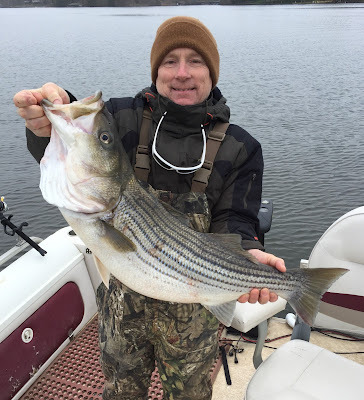 Before going out this morning I had thought the fish may have pulled out off the flats due to the cold front and that was where I was seeing the fish so I concentrated on deeper water. Next thing we knew we started taking hits. We kept moving then I got a whiff of Stripers and told the guys to get ready. Next thing we knew we had hook up after hook up. 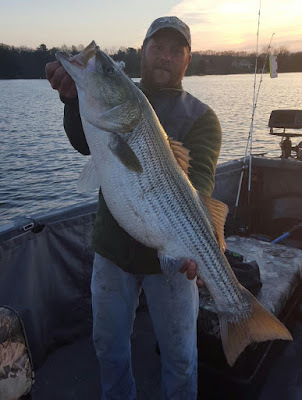 Things were crazy but controlled for a couple of hours then the bite simply quit. That was a good time to go look for some bait so we got our lines in and took off. We set up in another similar area but the wind was up and controlling the boat was becoming more difficult. After working it for 30 minutes I decided to go someplace with a similar pattern that may be out of the wind a little better. The move paid off and we were back in the action. Today the guys kept 18 Stripers and released about 6 punks. Plenty of good eating on that stringer. This morning I got out early and caught bait then picked my guys up at 7. I wanted to get a few "special" baits so I ran up and wasted 30 minutes looking for them but never found any so we went fishing. I wanted to work a shallow flat so I started deploying my boards over deep water with the intentions of having a spread of a dozen boards out when I hit the flat. As I was putting the second board out I went to hook the board on the line and a fish jammed the bait. I went to rebait it and the first one got hit. I finally got two out and yet another board got hit but did not hook up. By the time I got to the flat I wanted to work I only had 5 or 6 lines out. The board up on the bank hooked up and Eric jumped on the rod. After fighting the fish for a minute we boat it and it happened to be the first and largest fish of the morning. I continued to try to get my set out but the fish would not let me. I turned around and went deeper in order to get my spread out then hit the flat without a strike! 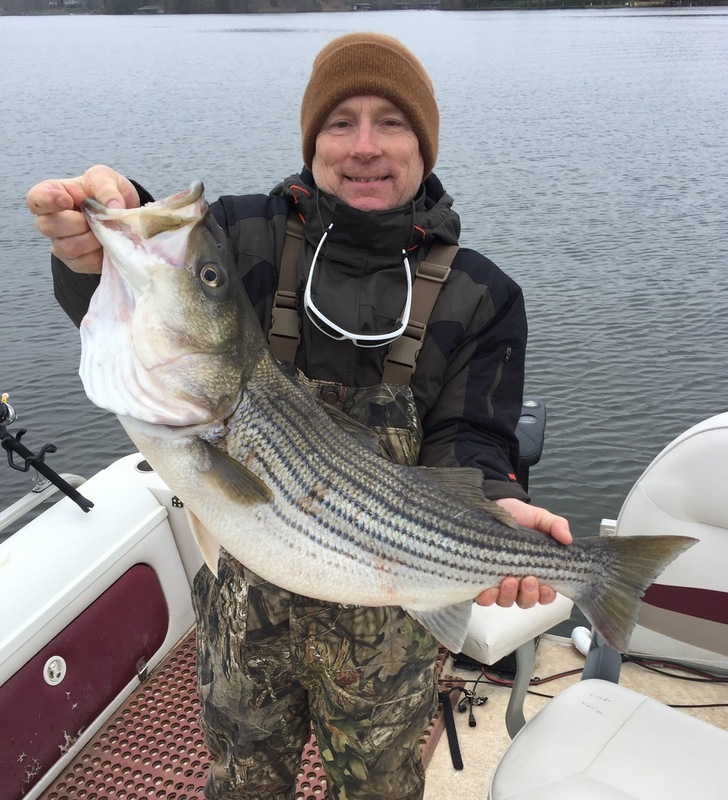 As we worked the flat we noticed a school of Stripers exploding on the surface a couple hundred yards behind us and they followed us for about 400 yards. Apparently I was in the school originally then lost it when I turned around then my timing got screwed up. We continued for about a mile hitting other flats and catching occasional fish. By 9 I wanted to go try to get some more baits so we tried but did not have any success. We then hit the inside edges of some flats with no luck then moved out to the outer edges and started hooking up with regularity. We continued to hook up until we had to get off the water so a couple of the guys could hop on a plane to go to work. 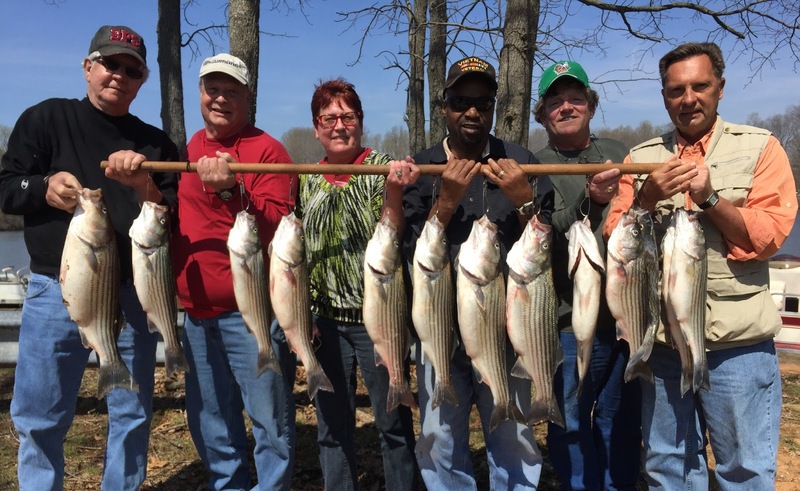 Although we caught 23 Stripers this morning we only had 11 keepers. Billy of Tires Unlimited hooked up with these two 32 inch Stripers at the same time. After reeling one in he grabbed the bobber rod and reeled it in as well. He said he needs to start lifting weights cause his arms were burning after reeling these two in one after another. DP to his friend Blake out on Sunday morning and banged these nice Stripers. 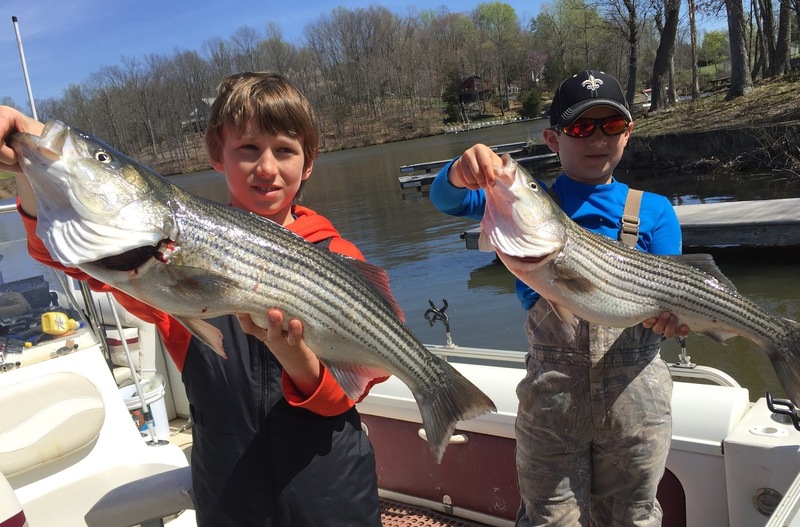 Anthony caught these two nice Stripers while fishing SML last week. Partly Cloudy and Warm, Water temps ranging from 59 to 50 degrees. Today I started off by catching 200 baits then picked the guys up and went fishing. On our first set we caught a few fish but after catching just 8 Stripers in 3 hours I needed to make a change. I ran up lake looking for any place where I could get 6 inches of visibility but there was nowhere that wasn't mud. We tried anyway then moved back downlake and finished the day working deep flats. Today was a tough day of fishing only catching 21 Stripers. Although our catch rate was low spirits were high and we all had a great time. High Point is just finishing up installing their new covered dock system. They have some slips still available and some will have lifts as well. 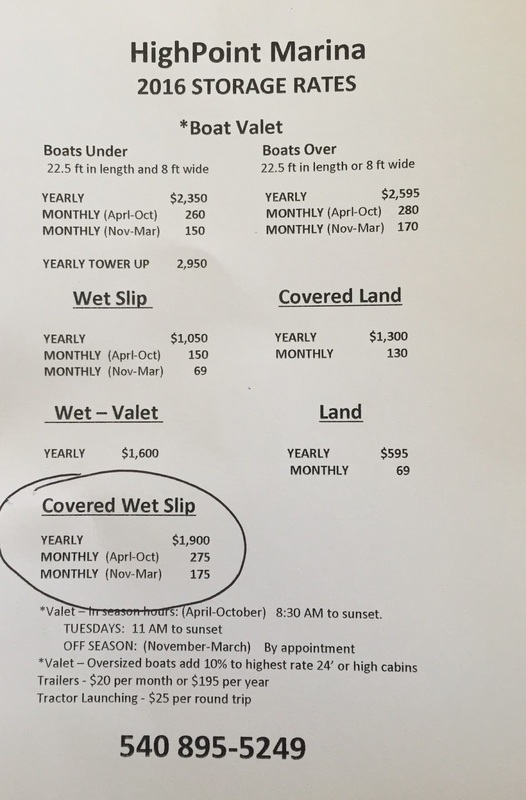 These docks systems are the bomb...over ten feet high [plenty of room for pontoon tops or Center Consoles with T Tops], Stone Floors [Very heavy and stable], 3 foot catwalks for each boat and Covered. They are also over deep water and floating so water levels will never be an issue. They also have installed 4 new gas pumps that will dispense 3 grades of Ethanol Free Gas and pay at the pump. They are located mid lake at the 208 bridge. Better reserve yours soon before they are all gone! 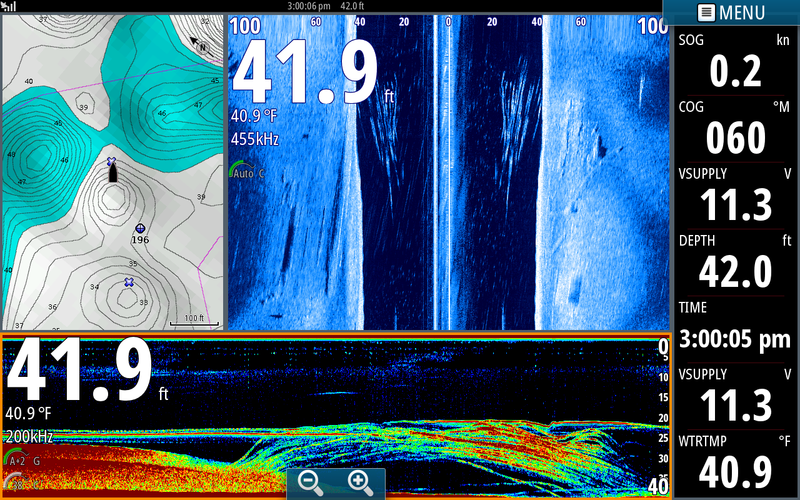 In this screenshot I had already gone over some Stripers on a 30 foot flat and wanted to go precisely back to the spot so using the touch screen I drug back to this area and created a waypoint by touching right where the + is. Once doing this it marked my Navionics map with an X and designated a # 222 for that spot. In the square box it showed me some data that I use to go directly back to the spot. It was 55.1 feet away from me and I headed 140* on my COG [right side of screen] to go back to it. It also recorded the water temperature and exact depth of the water. On the map I also turn the trolling motor to point the boat [black boat like figure] to the waypoint which also takes me to the spot. On this particular occasion fish were few and far between but we put downlines out at 25 feet and popped a couple. Some days I have to locate numerous tiny schools to put fish in the boat. My Simrad is my best friend on the water. In this pic I was working a 30 foot hump pulling a downline at 25 feet [long horizontal line] right through the Stripers. As you can see the bait went right through the small school and did not take a hit. 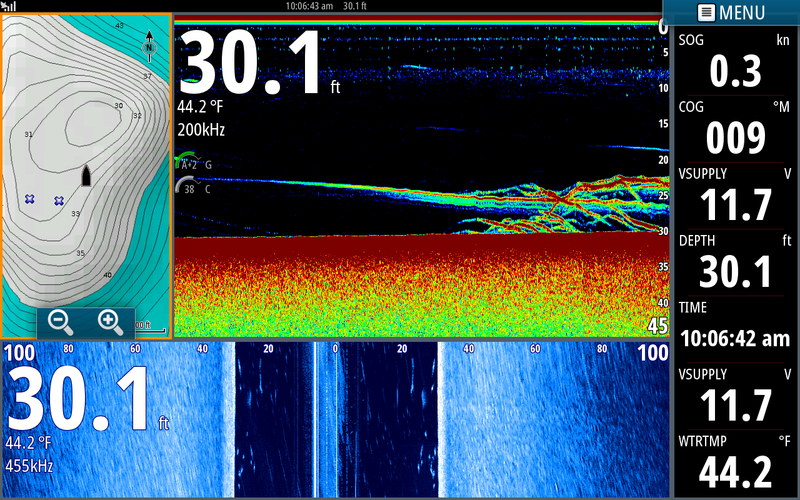 You can also see some Stripers on the side scan. By highlighting different depths on my map makes it easier to visualize the hump. I also marked a couple ares on the hump where we went over small schools of Stripers. 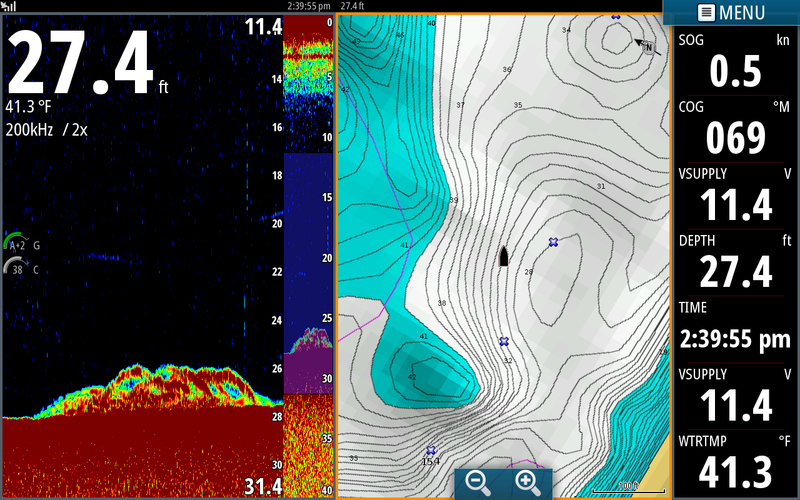 On this screen shot I was looking for small schools using my sonar and map. 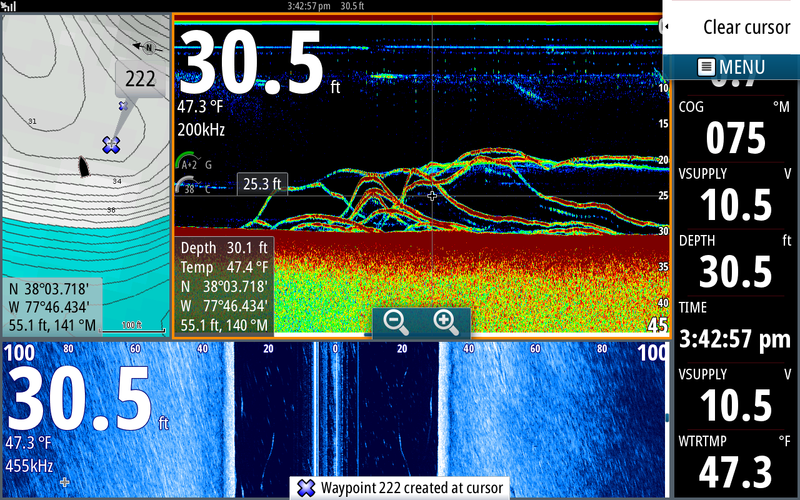 My sonar page is zoomed in to a 12 to 30 scale because the fish I had been seeing were relating to the bottom. The Blueish small screen in the middle is indicating the part of the water column I am zoomed into. These fish were small but I wanted to see what they were so I waypointed them, turned the boat around and put 2 baits right on the bottom. One of the lines hooked up with a 3 pound Bass. I was working ridges on this particular afternoon and hooked up with a Hybrid where the channel split the ridge into. Notice the bait being pulled through the school and not getting hit. 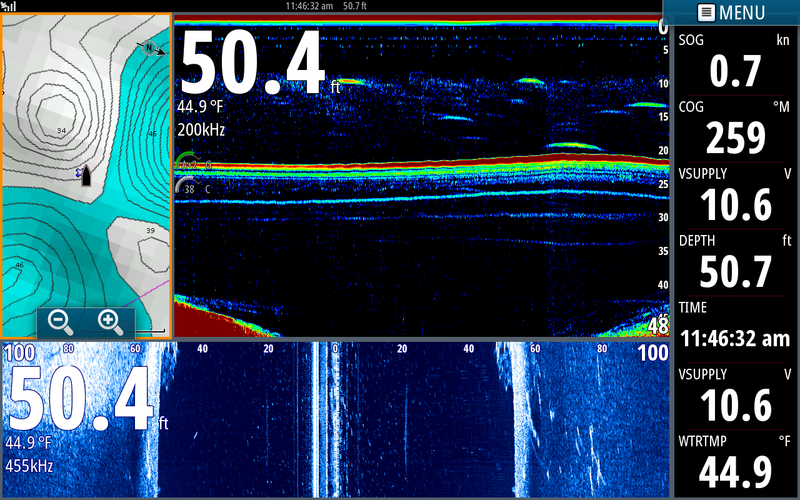 On side scan the fish look big but notice how slow I am traveling. When the boat is hardly moving the vertical marks are bigger because the fish stay in the picture longer. 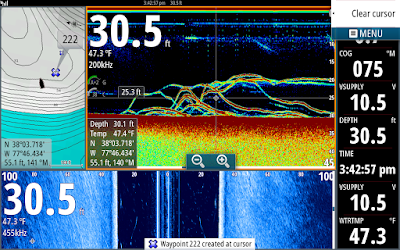 If you look at the sonar page you can see numerous fish but the arches are very thin and showing very little color. Larger fish at this speed would have much more color within the arch and the arches would be much more defined. Here I was pulling down lines at 25 feet and went over the channel and noticed Stripers 60 to 80 feet to the right of the boat on side scan. Fishing was slow so I maneuvered the boat over to them but did not get bit. When the fish are directly over the channel I seldom catch them. 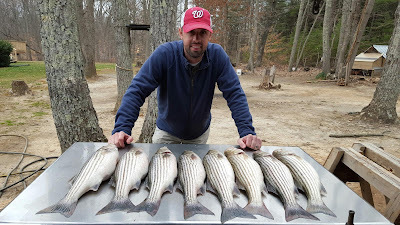 When I see them 95% of the time the Stripers are not feeding and I move on, as I did in the 2 pictures above. This morning I had a couple hours to spare before I had to go to an appointment around lunch time so I took Brian and his son Dylan and Walt out for some fun on Lake Anna. This time of year weather can be crazy, the last 2 day the wind howled and this morning it was so calm I was praying for a breeze to put a ripple on the surface. Usually when it is dead calm my shallow bite suffers so this morning I started out with downlines. We popped 6 Stripers pretty quick but after 10 minutes of catching it was over so we moved on. We pulled a shallow flat that I caught fish on a few days ago but the sun was so bright we only took a couple of hits. We made a move and hit another area with a whole lot of structure changes but only managed to catch punks. I couldn't stay out long this morning so we made one more move and tried downlines over 30 feet of water and popped some nicer fish. 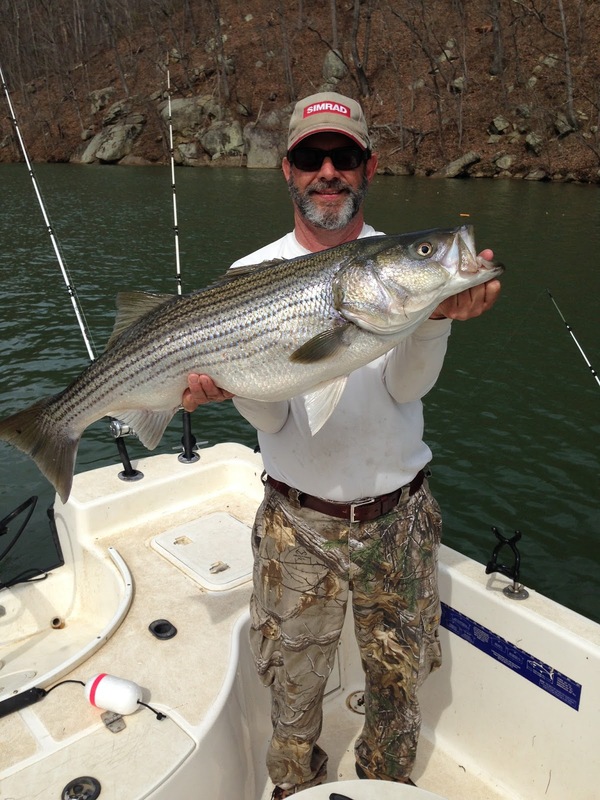 Dylan caught most of the keeper Stripers this morning and Walt is pictured holding a Citation Perch. He is a great Taxidermist and probably will make a nice mount out of this colorful fish.